LEV Sliding Sash Enclosures offer excellent containment and superior ergonomics using a unique constant air volume, sliding sash mechanism that allows the operator to access equipment at a range of heights. These units are custom-built to suit specific customer requirements. Popular for HPLC, Robotics, Particle Sizers, Lab Reactors, Rotary Evaporators, Milling, Sieving and other types of lab equipment for use with pharmaceutical potent compounds. The Sliding Sash LEV enclosures are designed and built specifically to the customers’ requirement. Size up to 3m wide. The LEV range of enclosures uses a unique CAV (Constant Air Volume) sliding sash mechanism that allows the operator to have good access to equipment and processes. 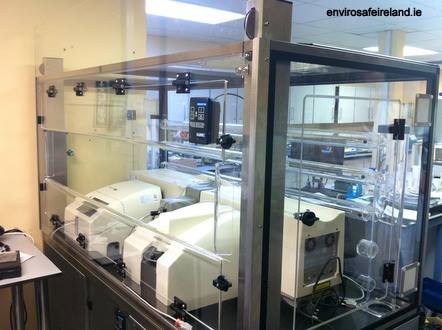 This system requires much less airflow than a standard fume hood which saves on energy costs. Fully supported by Ireland based service team.